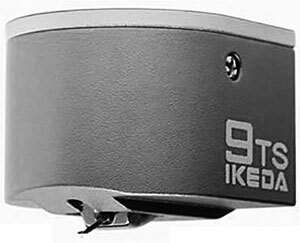 The Ikeda 9TS was developed as an entry model with an easy handling and high output by maintaining the superior reproduction and acoustic abilities inherited by the Ikeda 9 series cartridges. The stylus chip is shaped with an oval design which has been employed on the traditional Ikeda cartridges successively produced, and the cantilever is made of double layered duralumin pipe. In addition, the body and magnetic yolk etc that are very important components and keystones relating to the sound quality are made with the same architecture as the upper class Ikeda cartridges have. The Ikeda 9TS will be able to reproduce the powerful analogue-like sound filled with energy by keeping a nice balance ranging from the low to the high frequency. Ikeda 9TS / 9 TS owners manual, service manuals and schematics are for reference only and the Vinyl Engine bears no responsibility for errors or other inaccuracies. The PDF files are provided under strict licence. Reproduction without prior permission or for financial gain is strictly prohibited. This website is not affiliated with or sponsored by Ikeda.